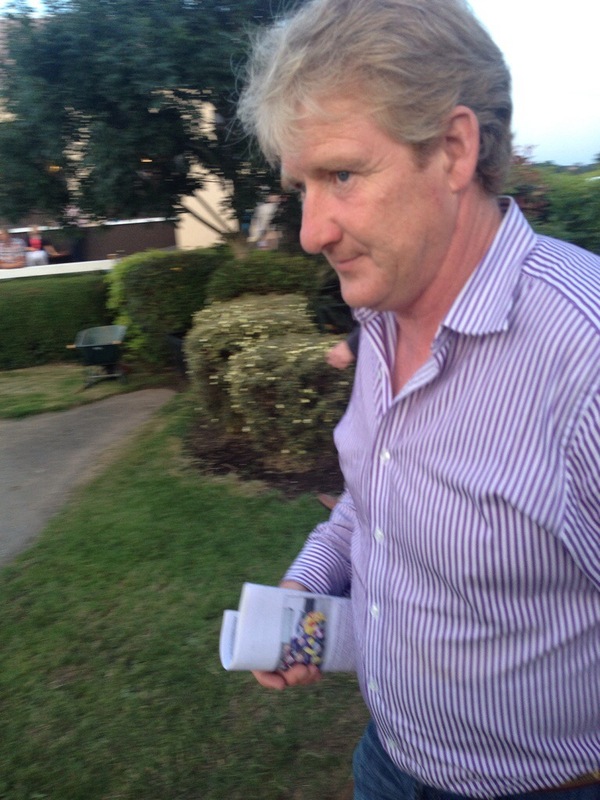 Fentons licence had to be revoked for the Turf Club to retain credibility! News filtered through over the weekend that Philip Fenton the Carrick on Suir , Co Tipperary based horse trainer had been sanctioned by the Turf Club following his recent court case. Found guilty in the Circuit Court last month of possession of drugs at his yard including a quantity of steroids in January 2012 he was fined in excess of €10,000 on that occasion. At a hearing on Saturday the Turf Club withdrew his training licence for the next three years with the sanction due to start on the 28th of November. This is no different to the sanctions handed down over the years to world class athletes , cyclists etc and seems to be in line with their length and severity. Fenton over the whole saga never attempted to explain nor give any indication as to how the steroids happened to be found stored in his yard and has only used technical details and legal arguments in his efforts to stop the court proceedings. He was entitled of course to defend himself in this way and it was up to the authorities to to prove his guilt. He might well still appeal all findings and punishments issued at this stage but the authorities had little option but to act in this way. A further financial fine if imposed by the Turf Club would have been a total cop out and they had to revoke Fentons licence if they were to have any hope of retaining credibility and ensuring any semblance of integrity in horse racing rules and regulations. Fenton , was and is a good trainer, having had some nice horses in his yard over the years but his court case and guilty verdict has tarnished his personal record but more importantly damaged Irish racing. Thankfully the racing authorities took the view that they had to act and they did, their actions should be welcomed. 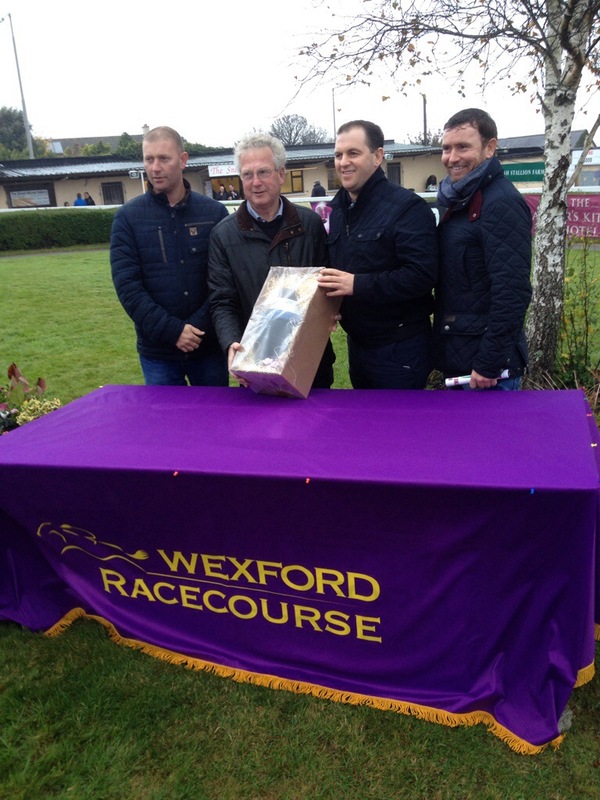 Vroum Vroum might well be a Festival mare on the evidence of this Wexford win. They very well might have been racing to the right for the very last time at Wexford on Tuesday last the 18th of November. Plans are well advanced at this stage for a trial raceday on St Patricks Day 2015 to race left handed or anti clockwise at the track following discussions with HRI and the Turf Club. This switch would see Wexford offering the only left handed track in the south east making it unique ! Anyway thats a story for another day, with the days headliner begin the Co Carlow based maestro Willie Mullins who recorded a fine treble under Ruby Walsh. With a small enough attendance , the bookies in the betting ring may have found it difficult to make a few euro with four odds on favourites on the afternoon, but I’d say matters were helped a little with the defeat of the local hot pot Loch Dara in the last. Three weeks ago the going at the track was good to firm over the October Bank Holiday weekend but following heavy rain in the intervening weeks it was officially described as, soft to heavy, heavy in places. But truthfully it actually raced much better than that, so any of the equine mudlarks would have been disappointed. Willie Mullins was not in attendance nor were many others from the racing world as the scheduled meeting clashed with the funeral ceremony for Dessie Hughes who was remembered with a minutes silence on the afternoon. The performance of the day was the victory of Vroum Vroum Mag in the Kerlogue Mares Beginners Chase for Mullins and his retained jockey Ruby Walsh. This 5 year old French bred mare by Voux Du Nord , already a winner over hurdles in France won this 2 mile 3 furlong race pretty much as she pleased at 11/8 on favourite. The went a good pace from flag fall with Davinia’s Tip leading for someway until Walsh took charge 4 out after his mare jumped her way to the front. She coasted home 9 lengths clear of Emily Gray and the always prominent Down Ace. Racing in the colours of Susannah Ricci this mare travelled well on the ground and jumped superbly. We just might have seen the debut of a top class festival mare here? Racing opened with the 2 mile 2 furlong Supporters Club AGM Maiden Hurdle where the Gigginstown silks were in the winners enclosure with victory going to Aminabad. The first of the three Mullins/Walsh winners this French bred 4 year old son of Singspiel already a Listed bumper winner quickened up past Domesday Book after the last to win comfortably from Henry De Bromhead’s horse and an eyecatching run from Tombstone in the same winning silks. The Mullins / Walsh treble was achieved by Measureofmydreams in the Slaney Maiden Hurdle where the Shantou 6 year old opened his account over hurdles in the colours of Gigginstown House Stud. A point to point winner and a bumper winner already , this horse would be one of the stars of most yards, but given the firepower in Closutton future plans for the horse might be a little unclear. The Mullins clan didn’t finish with their treble as Patrick Mullins was given the leg up on Boxer Georg by Shark Hanlon in the Rosslare Hunters Steeplechase with the 12 year old Taipan gelding winning at 5/2. With only four runners in the race, many were scratching their heads wondering just what is wrong with the racing world!!!! With €7,500 on offer it is mystifying that many would prefer to race in an Open Lightweight for €1,000 than to compete in this. Local trainer Leonard Whitmore won the equivalent race in 2013 with the Winged Love gelding, Loch Dara and Harley Dunne. They were back for a repeat performance here and in the intervening time Loch Dara had taken the Tetratema Cup at Gowran. They were sent off the 11/8 on favourites and tracked Mullins on Boxer Georg until hitting the front 2 out. Wandering or at least hanging to the left approaching the last Dunne and Loch Dara failed to negotiate it safely and left Boxer Georg to register only the second track win of his career. Now in the ownership of Catherine O’Farrell the horse will be campaigned in the point to point fields by her daughter Katie, with the long term aim to run in the Foxhunters at Cheltenham for the Kilmoganny, Co Kilkenny based mother and daughter team. Members of St Annes GAA Club were out in force on the afternoon as they paraded the Co Wexford Senior Football Cup which they won the previous weekend. 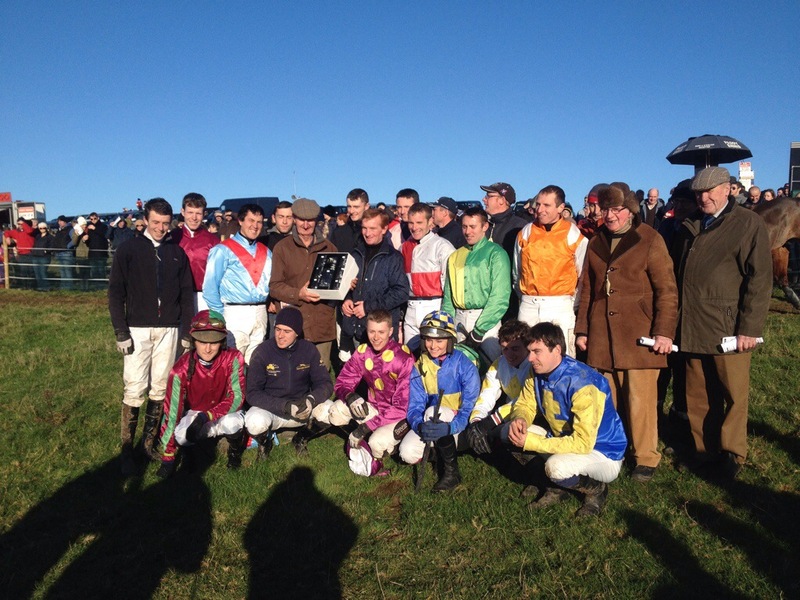 They were on hand to continue their celebrations with Murrintown native Robbie Moran following his win on Halls Bridge in the 2 mile 6 furlong Selskar Handicap Steeplechase. Moran, now based in Thurles, Co Tipperary had the 7 year son of Brian Boru in the first four all the way and having passed the leader, Adams Wood, they held the fast finishing Tailors Hill to win at 11/1. Trained in Co Tipperary by Shane Ryder and owned by Co Westmeath based owner/breeder Denis Hannon this was the horses first track win having been successful in the point to point fields. Robert Murphy brought Mrs Mac Veale from his Co Waterford yard to contest the 5 runner Join The Supporters Club Mares Hurdle. The Cappaquin, Co Waterford based trainer picked up the winners share of the €15,000 pot when the 9 year old Karinga Bay mare won under Andrew McNamara. The seventh winner of the day saw Oliver McKiernan and Shane Crimin join forces to win the Loch Garman Handicap Hurdle with the 5/1 shot Follow The Sign. The 6 year old son of Old Vic won this race with ease and if all of McKiernans future runners are in such form they should be feared. It looks like a pretty hectic weekend in the point to point fields. It looks like being a pretty hectic weekend in the point to point fields with a busy Saturday and Sunday planned. Racing kicks off tomorrow at Toomebridge with the Mid Antrim Hunt while the Golden Vale Foxhounds also race at Glenbane. Entries unfortunately are not that strong with just 63 and 80 respectively, with both meetings requiring a strong declaration to make racing competitive. The Dew Valley Open Lightweight at Glenbane has 13 entries with an interesting race on offer, if they all turn up! Eugene O’Sullivan has one of last seasons strongest Open horses, The Hollinwell entered from his Co Cork yard. He has not quite come back to that form this year but the softer ground and some stiffer galloping tracks might just help. Others of note here include, Eoin Doyle’s , Come To The Party, with the Co Kilkenny trainer no doubt hopeful that the 11 year old Taipan gelding can return to his winning track form at Limerick in 2013. I also spotted the 7 year old Flemensfirth gelding, Lord of Lords among the entries. Edward O’Grady also has given him an entry at Boulta but I’d reckon that if fit he might just run at Glenbane. This former bumper winner must have had an issue or two but he looks a possibility if saddled. The Open at Toomebridge sponsored by Doherty and Grey Meats has 11 entered and if you exclude the stand out entry, Oscar Barton, it looks a difficult race to decipher. Boxing Along and The Last Derby are entered here for Vincent Halley and David Christie. Neither of these two horses have run into form yet, with Christie also likely to be represented by The Hard Hat. This 10 year old Beneficial horse might not be the quickest but he has run reasonably of late, at Corbeagh House and Maralin. He may get most to do from Colin McBratneys Sole Witness, with the Witness Box 10 year old in good form since switching from the track. The Banks course at Lingstown on Sunday will see the Keating Transport sponsored Open at the South Wexford venue. With just 11 entries for the race, the other 5 races see a total of 107 on the day. The only real chance of a divide on the day is in the 5 Year Old Geldings Maiden which has 29 entries! The Open looks , perhaps, like being a match between Denis Murphys Theroadtocroker and Gordon Elliotts Current Exchange. Both of these horses clashed over the Banks course at Tattersalls Farm with Murphy’s 10 year old by Witness Box upsetting Elliotts 5/2 on favourite. The Tim Donworth ridden 9 year old Beneficial horse has since disappointed behind Seventh Sign at Kilworth, so he has something to prove here. But both of them might be under pressure to beat a returned to form Cork Citizen, with my hunch being that O’Sullivans Overbury 6 year old might just take the day if travelling up from Co Cork. The entries at the Co Waterford fixture at Boulta are the strongest, with a divide or two likely in the 4 and 5 Year Old Maiden’s. The Kenneally Steel Open has 17 entries with some notable entries including Adrian Maguires , Seventh Sign, Eoin Doyles, Davy From Milan, Denis Prendergasts , Easyondeye and Corkseagh Royale. When you throw in the returning Powerstation, Valentino’s Choice , Cork Citizen, The Hollinwell and Harpor it looks like a race to savour. 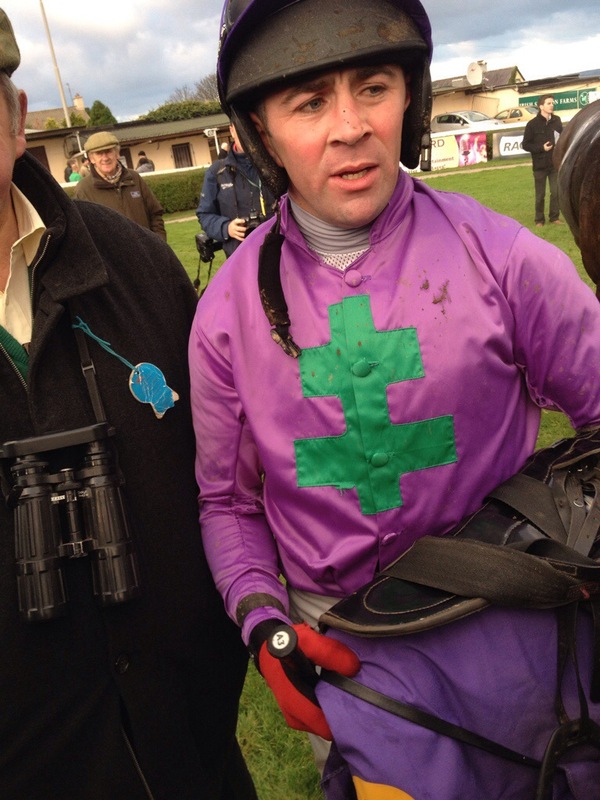 If Adrian Maguire gives Declan Queally the leg up again on Seventh Sign at Boulta they may just shade it. With Derek O’Connor, Jamie Codd and Barry O’Neill leading the way in the jockeys championship, this weekend will see all three strive to put more winners on the board. Just who leads the championship on Sunday evening is anyones guess. 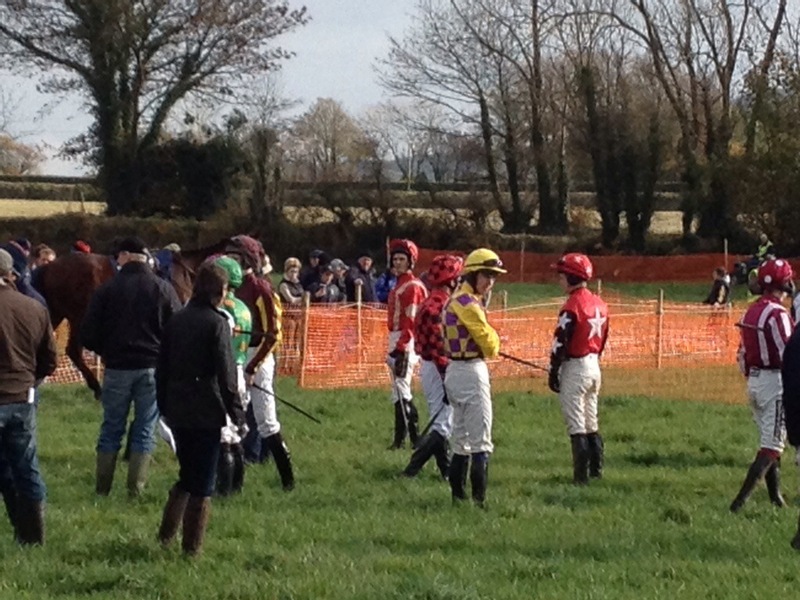 O’Connor and Codd match strides as Kavanagh and Donworth take the Opens. Affane and Corbeagh House managed to race on Sunday with both venues serving up a six race card for the Point to Point enthusiast. The Dungarvan Hunt saw Derek O’Connor record a double at the Affane course opening with Heron Heights in the 5 Year Old Maiden. This Donal Hassett owned and trained Heron Island gelding had only managed to complete one point prior to this, at Inchydoney, but built on that second place to win here. This looks like a sort for the sales in the future after a patient ride here by his Co Galway pilot. O’Connor served up a similar dish in the Mares Winners race which he took on the Joseph O’Keeffe’s Miss Oscarose. This 7 year old Oscar mare ridden by O’Connor for the first time, was winning for the third time between the flags and may repeat the fete before seasons end. The MMG Irl. Horse Rail Open was confined to novice riders with the Co Kildare based Roderic Kavanagh winning on Dantes King for Ross O’Sullivan. This 3 time track winner was a fine second at Grennan Mill behind Oscar Barton and looks like a horse that could provide Kavanagh another winning opportunity or two in his mother Antoinette’s silks. The 9 year old Kings Theatre gelding won this in a tight finish but there just might be more to come from him during the season. Racing opened at the Co Waterford track with a welcome win for Pat Collins, who took the opening Brightwells Bloodstock 4 year old Maiden with Eoin Doyles Jetstream Jack. This Beneficial gelding , raced in the colours of Patricia Doyle the winning trainers mother. It wouldn’t be a surprise to see this horse appear next in the sales ring! The other two races at this venue saw Eoin O’Sullivan win on the 5 year old Fruits of Love mare Um From Umbridge for his father Eugene while Jim Culloty saddled his own Topsham Breeze to take the Older Horses Maiden under Jonathan Fitzgerald. The new track at Corbeagh House was the venue for this seasons Weatmeath and Longford Hunt fixture with reigning champion Jamie Codd taking the first race on Cogryhill. Trained by Gordon Elliott and owned by Wilson Dennison the well supported 4 year old by Presenting made an eyecatching debut. Codd kept tabs on Derek O’Connor at the head of the jockeys title race with a double of his own when winning on Chosen Dream. The Well Chosen 6 year old gelding, had a bit of track form but has really blossomed since going pointing, taking his fourth race here. Trained by Graham McKeever , they just might be tempted to return to the track , but thats just a hunch. Another former track performer, Barry Connells Court Frontier, finally got his head in front when winning here under JJ Firzpatrick. 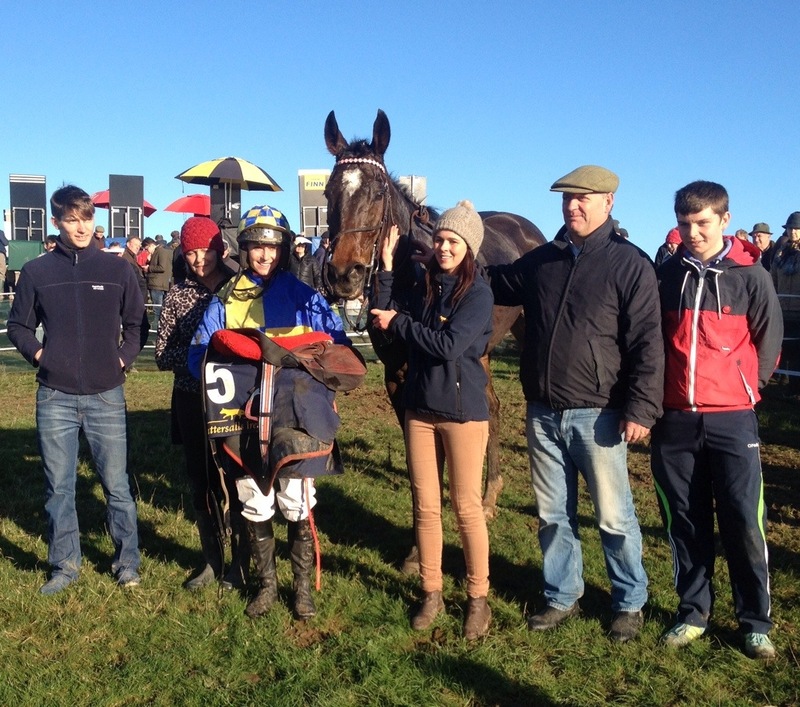 Trained by Alan Fleming the Court Cave gelding ran well at Ballinaboola last weekend when a staying on second. A return to the track is also likely for this horse, but I wouldn’t rule out a hunter chase or two rather than hurdles! Gordon Elliott has kept his new recruit Oscar Barton on the go since the start of the season with the Tim Donworth ridden horse winning for the third time so far in the Open Lightweight category. The took the Quinns Supply Stores Ltd Open here with a spin in a Hunters Chase now on the agenda. The final two winners here saw Mr Cosmopolitan win for Jim Dreaper and Paul Cawley with Jo Go taking the Mares Maiden NJ Terry and Caroline O ‘Leary. Stilletto puts the boot in for Latta as he tops the Brightwells Sale. The Cheltenham Open Race meeting includes a sale of Horses In Training under the Brightwells banner with the focus primarily on horses with form between the flags. Young Co Wexford Point to Point handler Andrew Latta sold the evenings top lot when Stilletto was knocked down to Roger Brookhouse for £130k. The 5 year son on Westerner made his debut at the Iveagh Harriers meeting at Maralin on the 8th of the month a winning one under Barry O’Neill. He created a headline or two after his all the way win there in the colours of his owner breeder William Powell-Harris and that good impression translated into a good price here. Latta ,based outside of Enniscorthy , Co Wexford got his sales topper out before the floods hit the area over the past few days and must have been pleased with the result. Brookhouse is a regular investor at sales such as this and while plans for the horse maybe a little unclear, Latta and his relations will be hoping to put the boot in on future occasions after this success with Stilletto! 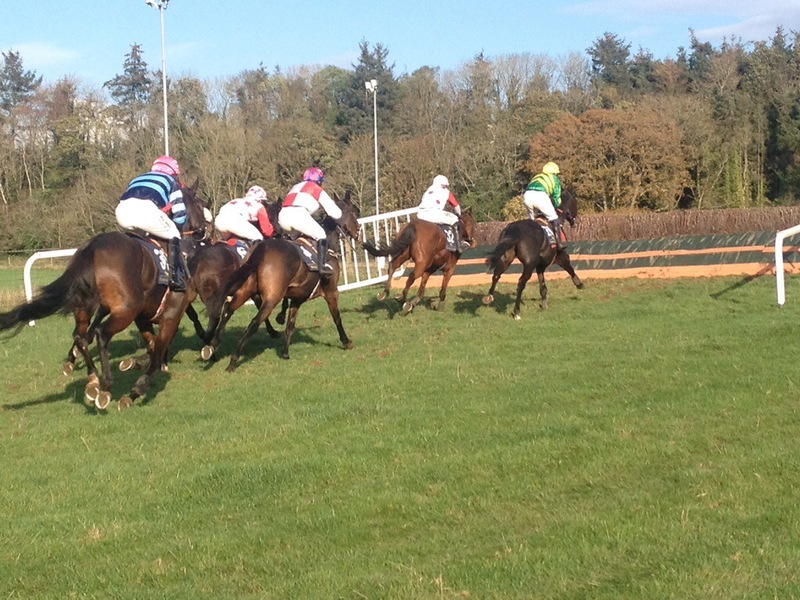 The Kilworth and Araglen meeting last weekend saw Pat Doyle saddle Amber Gambler to win under Derek O’Connor. This German bred son of Doyen, will transfer to Rebecca Curtis in Wales following a bid of £125k this evening. Doyen now stands at Michael Hickeys Co Kildare Sunnyhill Stud , following a sojourn in Britain and Germany. 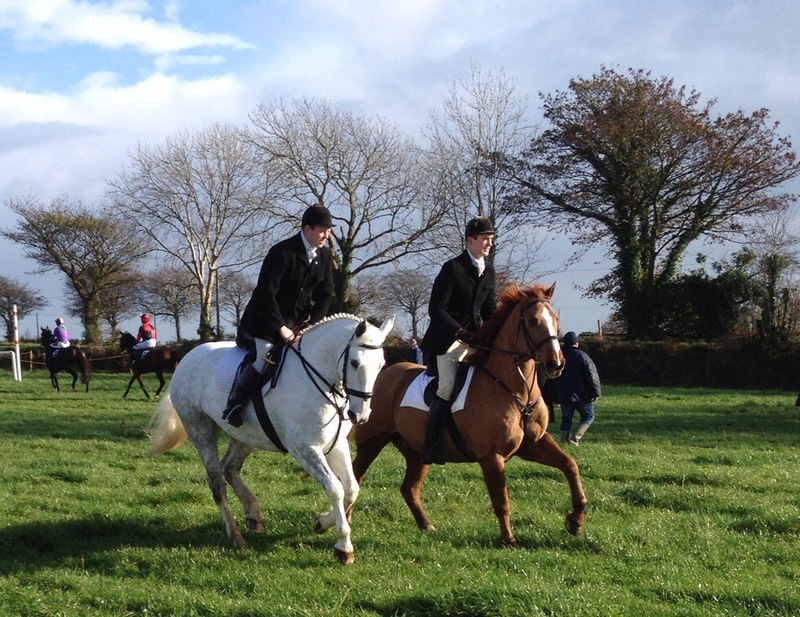 With less than 60 lots on offer during the evening including last weekends 4 Year Old Maiden winner For Instance at the Wexford Foxhound meeting at Ballinaboola. 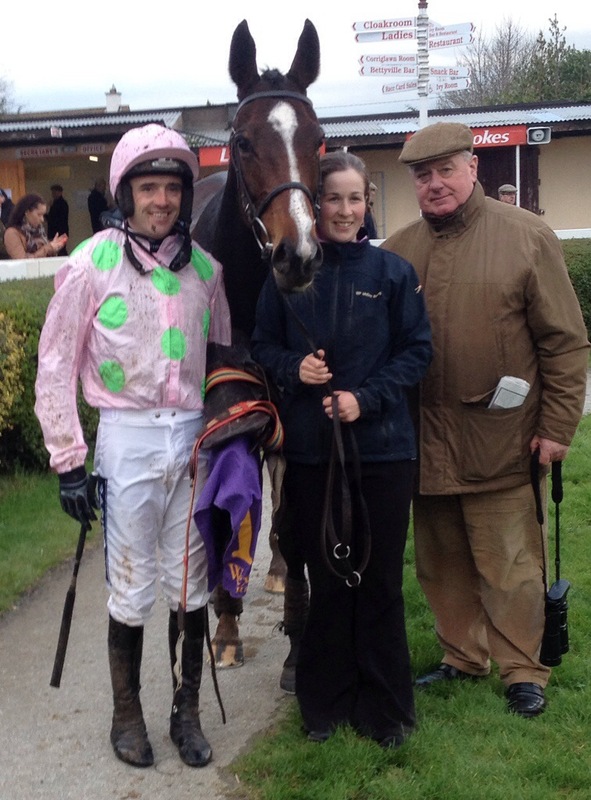 William and Jamie Codd shared this win on For Instance which raced in Jean Codds silks. The son of Milan was signed for by Ross Doyle at the sale having bid £85k. Codd was keen to emphasise on that day the ability of the horse and while running a little green his new owners will be keen to see him progress from the Point to Point fields. He already has bumper form so it might well be money well spent. 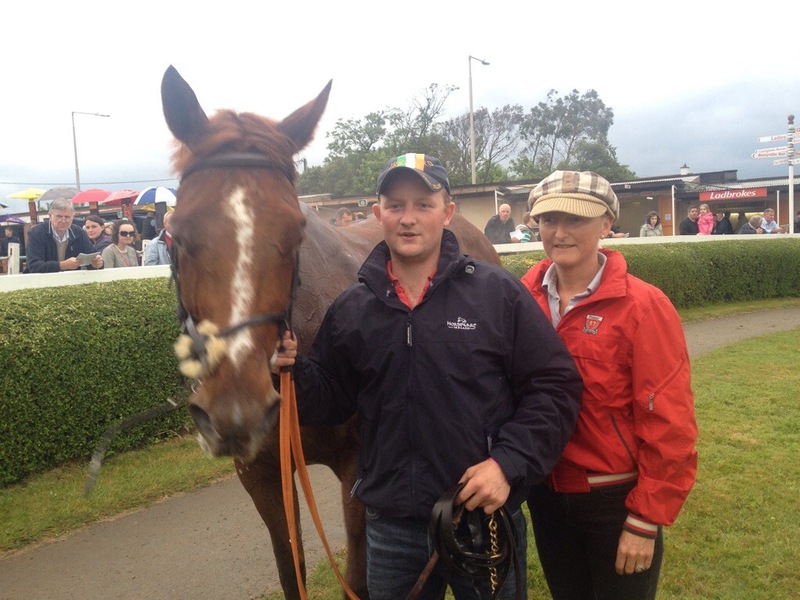 £80k secured Shantou Village this evening, with the Denis Murphy trained horse being knocked down to Neil Mulholland. 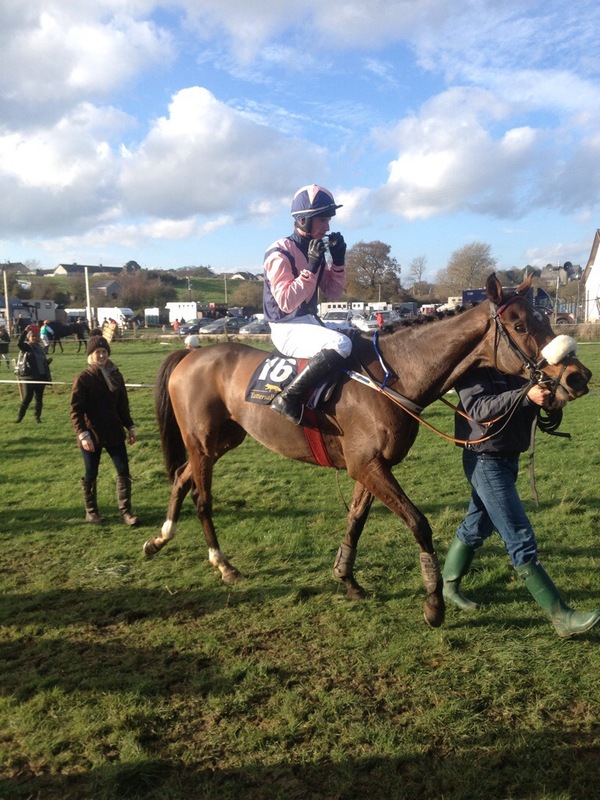 A debutante winner at Loughanmore on the 25th of October in the hands of Jamie Codd, the son of Shantou based in Burgage Stud , Co Carlow raced in the colours of Thomas O’Sullivan. O’Sullivan and Murphy are becoming a real force in this sector and don’t be surprised to see more winners from this duo. McBratney holds the Open key at Kirkistown and Corbeagh House. Three Point to Points are listed this weekend but following some heavy rain over the past few days it would be wise to double check racing at all venues just to see! The North Down Foxhounds racing on Saturday at Kirkistown with only 67 entries are listed so we have little fear of a longday in Co Down. Sunday sees 79 entries at the Dungarvan Harriers meeting at Affane with the same number listed at Corbeagh House with the Westmeath Foxhounds and Longford Harriers hosting the event. Thats just 225 horses entered in 18 races at 3 meetings, an average of a little over 12 per race, hardly the sign of a healthy sport ??? mark and Barry O’Neill with 9. A double for O’Connor with the Pat Doyle trained Amber Gambler and Vinalhaven was followed up on Scoop It for Robert Tyner to see the Co Galway man keep pressure on the Co Wexford pair. The Co Cork fixture also gave Declan Queally yet another winner with the http://www.talkinhorses.ie Co Waterford jockey winning the Open with the Pivotal 5 year old Seventh Sign. This was a pretty extraordinary performance by the former track race horse with his handler , Adrian Maguire,planning to keep him between the flags for the present. 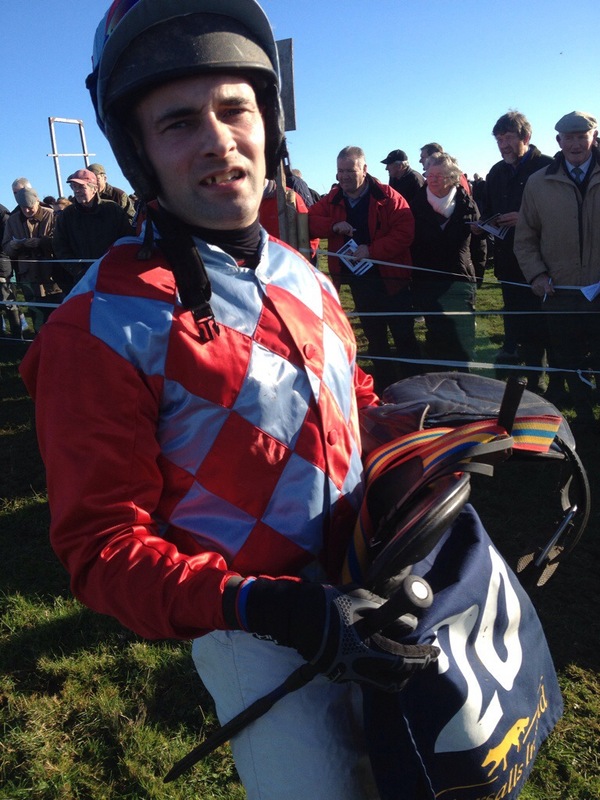 Queally may well be at Affane on Sunday as could some of last weekends other winners Damien Skehan, Richie Deegan, Harley Dunne, Steve Clements, Mark Lynch and Noel McParlan, but it all depends on what bookings they get. Action in the Open at Dungarvan will be restricted to Novice Riders but a nice entry including Becauseicouldntsee, Boxing Along, Isourbell , October Revolution and The Hollinwell makes it look like a pretty intriguing race. My guess is that the Noel Glynn trained Becauseicouldntsee could make the trip from Clare and if turning up might well account for Isourbell and The Hollinwell. A number of these entries also have the possibility of opting for the Westmeath and Longford where the Colin McBratney pair of Caronstown Boy and Marito are also listed. With another interesting entry here in the shape of Shark Hanlons former classy track horse, Luska Lad. Where or who will McBratney run here? Both have an option at Kirkistown so …..????? I will take a guess here and suggest that if both run this weekend , Carsonstown Boy will race at North Down and Marito at the midlands venue, with the key to both races being possibly decided by McBratney!! !